How do I use the Product Import CSV Sample File? 3dcart allows you to import your products using the Import/Export feature from a CSV file. To download the sample products import file please log into your 3dcart Online Store Manager and navigate to Products >Product List. Next look towards the top right of the page and click on the "Export/Import" button. Once there, click on the + icon for the product import function. Directly below the "Browse" button for the main product import section, you will see a link that will allow you to download the Sample file. This article will show you how to properly use the sample CSV file to upload your products to your 3dcart store. The instructions provided here will be in regards to adding new products to your store via the CSV import functions. To update existing products on your store, it is usually best to export your existing product CSV file and edit the file for later upload. First download the sample products csv from the previous link or you can login to your Store Manager and go to Products > Export/Import from the left navigation menu, then click on the Sample link above Products (under the Import section) and download it to your computer. You will need a Spreadsheet editor like Microsoft Excel to open this file in your computer, if you don't have this installed on your computer visit www.openoffice.org/ to download a spreadsheet editor. The Products Import Sample file allows you to import the following information. Do not remove or add any columns to this sample file. If you do not have need for a column please leave it blank or follow the instructions for the field that follow. This field is required. It is the unique product id (SKU or Part Number) of the product. This can be any combination of letters and numbers you choose. The system will assign a separate database number that will be used to keep track of each product in the backend of the system, this is called the catalogid and will only show in a product export. The catalogid is not included on the sample file since it is not needed for importing new products. This is the unique manufacturer id that may be provided by the manufacturer of the product or you can assign this on your own. This is an optional field. This is the name of the product. This is a required field. This is the name of the Manufacturer this product is associated with. The list of Manufacturers is configured in your Online Store Manager by going to Settings >General >Manufacturers. For more information on adding manufacturers to your store's list can be found here. Also, any new manufacturer entered in the CSV file will be automatically created in the system. This column will assign the product to a particular category. The field refers to the path of the category and it allows you to set one product in multiple categories. To add the product to a Main Category simply put in the Main Category name. Any new category entered in the CSV file will be automatically created in the system. To add a product to a Sub Category use the / character, i.e. "Category 1/Sub Category 1"
To add a product to multiple categories at once use the @ character: "Category [email protected] 2" or for sub-categories "Category 1/Sub Category [email protected] 2/Sub Category 2"
When naming your Categories, please be careful that you do not use symbols such as the forward slash (/) or the @ sign since these may be recognized by the import system as brand new categories. For example, a category listed as "Women's/Girl's Fashion" on the CSV file may inadvertently be created as one category for "Women's" and a separate sub-category for "Girl's Fashion"
Quotation mark symbols (") may also yield unexpected results. Therefore, we recommend the following alternatives to these special characters. This is the base cost of your product, it's for internal use and won't be displayed to the customer. This is an optional field. This is the price of the product that you want to charge the customer. Use only numbers; do not enter the currency sign. It's a required field cannot be left blank for any product. This is the MSRP or Retail Price of the product. If this is added to the product then the Savings will be displayed to the customer. This is an optional field. This is the stock (Quantity On Hand) of the product. It's required when Inventory Control is enabled. This is a numeric field. This is the weight of the product. It is a numeric field and is required when doing Real Time shipping calculation. 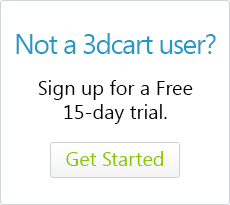 The 3dcart store does not calculate weight based on any specific weight measure. Numbers entered into the weight field are merely the numbers your shipping carrier requires to measure weight in their particular shipping calculation forumlas. In other words, if your specific carrier deals in metric units such as kg, then your product weight numbers should reflect the kg weight. Alternately, if your shipping carrier uses standard measurements such as lbs, then the weight entered into the CSV file should reflect the standad unit. More information on this can be found here. This will mark the product as free shipping. If free shipping is checked then Free Shipping will show during the checkout process as an option. Insert 1 to mark as Free Shipping. Insert 0 if you would not like this product to be marked as Free Shipping. This is an optional field. This is a field that the system will assign once the product is added to the database. This is an optional field. This is the short description of the product. This should be a short text description (less than 250 characters). The content of this cell is displayed in the Search Results page. This is an optional field. This is the Description of the product, there is no size limit in this field and HTML is allowed. These are additional keywords used by the internal search of the site, you don't need to add any keywords that are already part of the name or description of the product. This is also used in the dynamic Meta Tags function for the product pages where the system will automatically generate Meta Tags using the name, extended_description and keywords of your product. These keywords do not show on the website to the customer. This is an optional field. This will hide the product from the website. Insert 1 to hide. Insert 0 to keep the product visible. This is an optional field. This will determine the product's sorting inside the Categories. This is an optional field. You can also set default sortings for the entire category from the Online Store Manager under Products >Categories | Category Options button. This is the path to your product's thumbnail image. This is the path to your product's main display image. Keep in mind that the CSV import file is intended to only contain the paths to your image files. The actual images themselves must be manually uploaded prior to importing the CSV file. Image upload can be done via the "File Manager" inside the Store Manager or via FTP. The default root path for all images is usually "assets/images/" if you upload via the file manager. Also, please note that if your images are hosted on your site, it is not necessary to include your domain name for the image paths. This column will define the related products for this product. To assign related products insert the related product's ids separated by commas. For example, "related item id1, related item id2, related item id3" can be listed in the cell. This is an optional field. The system also allows to use Random Related products from the Store Manager under Modules in the Home Specials module. This is the name of the Distributor this product is associated with. This is an optional field. The list of Distributors is configured in your Online Store Manager by going to Settings >General >Distributors. For more information on adding manufacturers to your store's list can be found here. Also, any new distributor entered in the CSV file will be automatically created in the system. This will add an additional shipping fee to the product if you wish to do so. This fee will be added to any shipping methods that you have set. This is an optional field. This will mark the product as a home special which means that the system will place this product on your home page. Insert 1 to mark as home special. Leave blank to not mark as home special. This is an optional field. This will mark this product as a category special which means that the system will place this product on top of the Category that it resides in. This is an optional field. This will define the title of this product in the web browser. By default, the system will use the product name. This is an optional field. This field is for more advanced users that know how to properly format Meta Tags. If you are unfamiliar with how to setup Meta Tags properly the best thing to do is leave this field blank and use the Tag Wizard in your admin. This is an optional field. Once you have completed adding your products to the sample file, save it as a separate csv file and name it something that you will easily recognize for the import process. When saving the file in your spreadsheet program, select the "Save As" option and be sure to specify the CSV filetype as "CSV (Comma delimited)(*.csv)." If using a Mac, save using the "CSV (Windows)" option. Most spreadhseet programs contain this option and it will ensure your CSV file's formatting is fully accepted by the 3dcart store's import system. Next, click on the "Export/Import" button located at the top right of the page. Using the browse button, select your saved CSV file and click on "Import File"
This will insert any new products found on the CSV file which are not currently in the store's database. It will not update any existing product information found on the file. This will update any information found on the CSV file that is also currently in the store's database. The information in this csv file will override what is in the database. This is a combination of inserting and updating. The system will insert any new information as well as update any existing information. This will completely remove all the product information from your database and then insert the information. Please read the warning and make sure that this is what you want to do before using this option. This will completely remove all the product and category information from your database and then insert the information. Please read the warning and make sure that this is what you want to do before using this option. Since you are importing new products, either Insert Only or Insert + Update will be the best options to choose in this case. Make your import selection and continue the import process. The store will import the CSV file's information to your store and populate it with your products. The actual import/export process takes place "behind the scenes" of your store's software to prevent it from interfering with your store's active processes. By allowing the function to work in the background, you can go to other pages of the admin and still work on your store while importing or exporting large files. During the process, you will be taken to the Import/Export Status page which will display a grid layout of your recent imports and exports. The progress column will show you the progress of the import. Notify Me: For larger, more time consuming files; this option will let you input your email address so that you will receive a notice once the import/export is complete. View Log: Allows you to review the log of the import/export so you can see how many items were updated, inserted or if any records failed. Retry: If for some reason the import/export fails, you may use this option to attempt a retry of the file. Delete: Use this to delete the record altogether from the status page. This will be present in all of the store's Export/Import functions. Please make sure your store's secure URL is pointing to your 3dcart store. Note that this product import does not allow for importing Product Options (Sizes, Colors, etc.) with these products. The options import is a separate function. Click here to learn how to import product options. Please note that all products must be imported prior to importing any options.